This practice needs to be emphasized over and over again, and the benefit will be greater when players comfortably execute the entire swing from address, take away, back swing, downswing, impact, all the way to follow-through. Here, a lot of great components are included such as swing arc, swing plane, swing width. By extension, we mean that stretching out as straight as possible for back swing as well as follow- through. 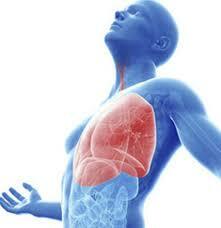 Many tips and lessons have been provided with each tip with different presentation. 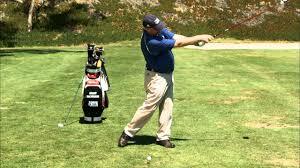 Good extension with the golf swing will encourage a wider golf swing arc. 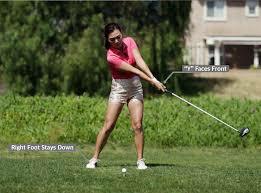 This leads to more power and distance and better contact with the golf ball. 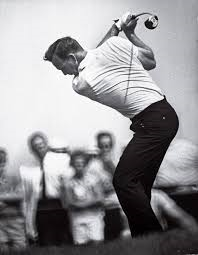 Keeping the arms straight through the takeaway, impact area, and beginning of the follow-through while maintaining good swing extension will more likely to produce straight and powerful ball striking. I’d like to introduce what Moe Norman, a legendary Canadian Golfer, has taught long time ago. As you may remember, he wanted to hit/touch the point with club head straight almost two feet away while taking away the golf club. This is the first half extension. The second half extension would be to hit another point which would be in more than 30 inches forward while doing follow-through. Imagine how wide and straight the swing path and plane would be. 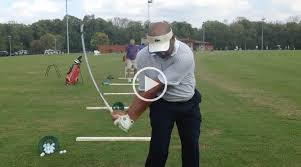 He used the unique swing postures and methods, and he showed us a lot of great points we can adopt for more solid and straight golf swing. Practice more and more on extension until this will be very comfortable and natural to you. 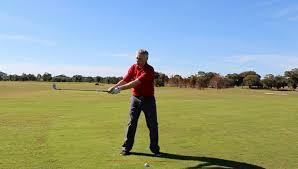 This exercise, without any doubt, will help to generate a great ball striking. It is worthwhile to notice that there are varied differences in Face Angle of Drivers when they naturally lie on the ground at address. Some club may have Closed angle and other may have very neutral. Most of modern drivers have somewhat closed face angle when they are lying on the ground. For Driver, handle would be positioned slightly behind the club head when addressing the ball to promote hitting the ball at upswing. This is when some conflict can happen between natural grip and club face. In other words, golfer may have to intentionally rotate grip a little bit to the right (especially when Driver has Closed face angle at natural lie) to make Club Face square to the ball. This would be a very delicate extra effort on grip, but this could also be a source of less-perfect hit (or club face not perfectly square at the time of impact). 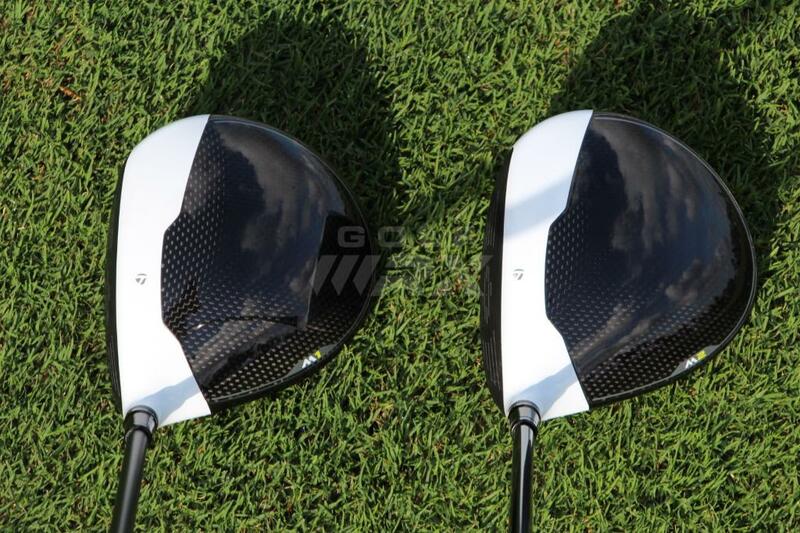 In this case then, it would be better to choose Driver with neutral face angle. 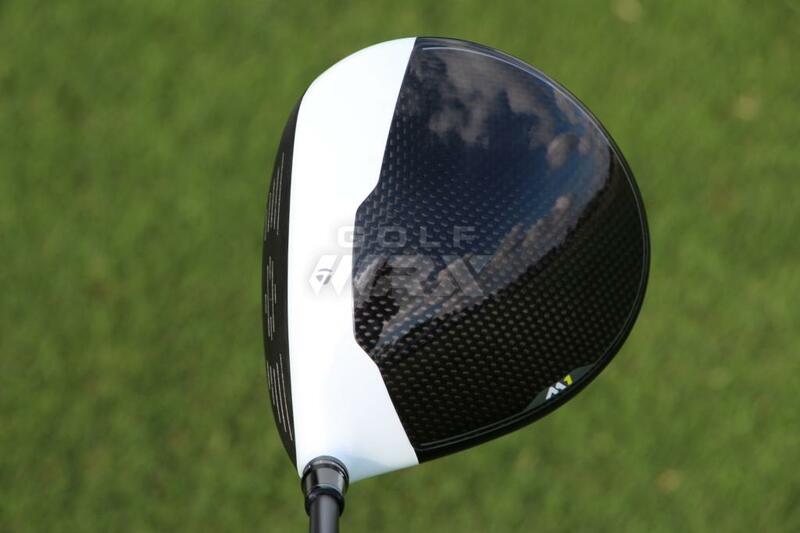 Author recently noticed that Driver on the market has more or less neutral Face Angle rather than Closed Face angle. 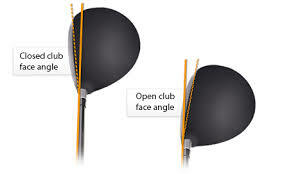 Please remember there are some Driver that really encourage draw, and this type of driver would have much Closed Face angle. Player should pay more attention to what kind of Driver to choose next time. 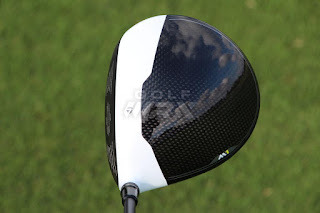 It would be really worthwhile to experiment the ball striking with Drivers with different face angles. 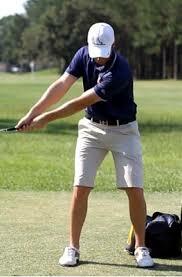 Good posture in Golf swing is very important. Posture has to be stable from the beginning to the end finish. In particular, the degree of bending down or tilting is so critical that this may be a one of dominant factors for the stable and consistent ball striking. Good posture is grounded in a forward tilt or bending down from the hips -- not the waist. There may be a specific degrees of bending down, but please remember to bend down enough about 30 degrees or more. Please see the picture of late beloved golf legend and international icon, Mr. Arnold Palmer when he was young and a very dominant player. It is quite surprising to see how he maintained the degree of bending down from the hip. 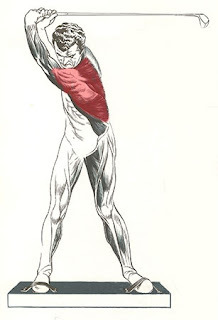 Try to accommodate this posture to your golf swing and see how differently you will strike the ball. This picture was featured in 2017 Golf Digest magazine and is also available in public site. I am sure we can learn a lot from this picture. Thanks be to Mr. Arnold Palmer and he will be missed for a long time and for many generations. I hope you can improve golf swing this time significantly. There have been two schools of thought about golf swing. 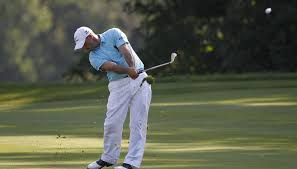 Traditional thought is that golf swing is closer to being vertical and finishing high. However, recent thought would be that golf swing is rotational and swing plane would be flatter rather than being vertical. There are major differences between two thoughts. Vertical swing or swing plane will definitely promote and encourage straight ball fly after hitting. 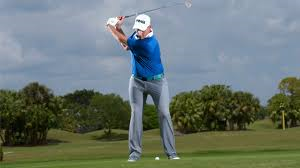 However, rotational swing will tend to be hitting the ball to the right or left because of rotational movement of body and arm but with more power and lack of control. There is no clear reason for this shift of thought, but every player has to understand the pro and cons of two different swings. 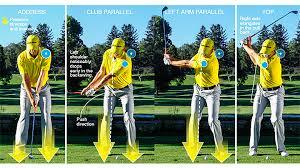 This article strongly suggest that Vertical Drop is the right way. Vertical Drop Swing will be more accurate and encourage the straight ball fly after hitting. 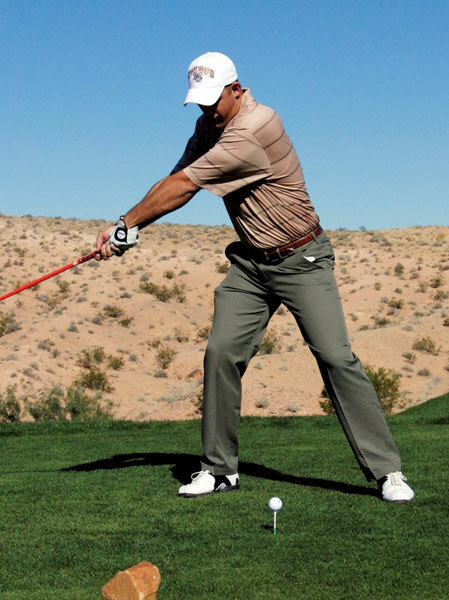 This gives a huge benefit and advantage over the rotational swing. 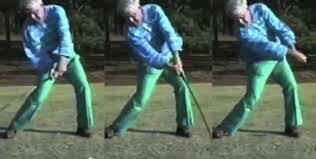 Then, what kind of simple mechanics and tips are involved in this for consistent and repeatable swing? a. Now back swing has started. Make sure to recognize the moment when the left hand is reaching exactly over the top of right foot. At this time, left arm will be very much parallel to the imaginary line that can be drawn with two toes and target point. b. Takeaway (not Rotation) will happen only with using upper body and shoulder, not using lower body or hip, but using very minimal waist turn. c. Imagine that your back swing completely stops or pauses for a second. I would say this is point of lifting. The left hand which grabs the golf club would be very vertical, almost pointing to the sky vertically at the height of waist. This point is very important because we will lift the left shoulder and arm and hand together up vertically after this point. d. Simply lift up the left shoulder along with hand and arm together. This lifting will be extremely important because we want to make sure that the top portion of left shoulder is naturally touching up the bottom of chin. 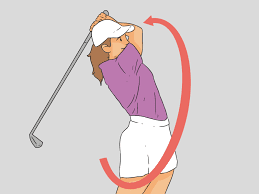 e. Lift up further and further until you reach at the peak of back swing. 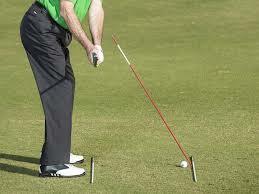 Here, at peak, the shaft of golf club does not have be parallel to the ground. In other words, three quarter swing should be enough to generate enough power with such an accuracy. f. Make sure that right hip around right back pocket area does not rotate that much. It will stay with only minimal rotations, or virtually no rotation at all. Second, Vertical drop or Down Swing. a. 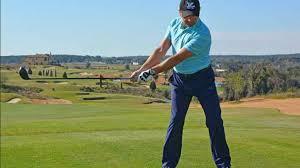 We want to use the power of natural gravity from down swing or simply vertical dropping of club. We want to trigger the powerful dropping of club with natural gravity. b. If possible, we want to minimize the movement of wrist as hard as possible in order to result in such an accurate hitting of golf ball with iron blade or drive head. The more we use the wrist movement, the lesser the accuracy of ball striking will be. This is a known fact and this has to be stressed over again and again. a. The Finish will be a series of action, but more or so it would be the same of reverse back swing. b. In other words, make sure to recognize when the right hand stretches out and reaches to the left side lifting point (this would be almost symmetric to beginning of back swing). c. Likewise, simply lift up right shoulder along with right hand and arm together. Please make sure that the top portion of right shoulder is naturally touching up the bottom of chin. d. Lift up further and further until you reach at the peak, so that you can finish the swing. e. Right hand will stay high at around 11 hour clock, not necessary at 12 hour clock. f. Body shifting from center to right and back to center and further to left will be done naturally and smoothly. Thanks for reading and I hope you will have a huge improvement in golf swing this season! Do you make a wild shot? Wild drive or wild iron shot even when you are perfectly positioned on the fairway? I do, and I wanted to know why I make such shots. 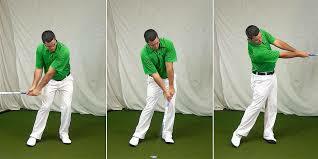 (1) Re-gripping (squeezing) at the top of back swing. 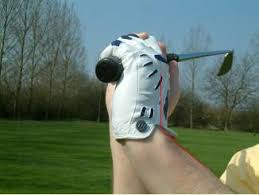 Do you find yourself do re-gripping or squeezing your palm more in order to hold grip more firmly? This would be one of major reasons for a wild shot. If you do squeezing at the top of backswing, there will be a lot of chances to interrupt the angle of club head. 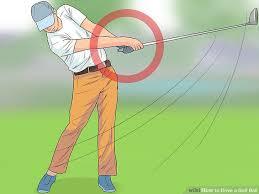 You will hit the ball with totally wrong angle of blade or club head. This can happen without any knowledge. One way to fix this type of error is to grip relatively firmly from the beginning. Or, you can use a bigger/super size grip, so that grip can be attached to the palm and finger with more squeezing. 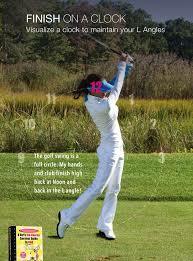 (2) Do you maintain the same or high level of focus in the back nine? We normally spend almost 5 hours in the field to complete 18 holes. These are long hours, and this requires a lot of patience and concentration. Make sure to maintain the same pre-routine and basic principles you do both in the front nine holes as well as in the back nine. (3) Aiming at the target incorrectly. Please check your foot position and lining up. 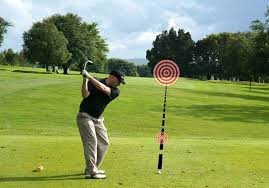 As you play more holes, there would be a tendency to be slightly off with aiming. One way to avoid this would be to use the shaft as a directional guide with holding it closer to chest and pointing to the target. This will help you make sure you are lining up correctly. And bend enough as you normally do. You may get loose with all these basics while you are playing more and more holes. Keep focused with the same alert level. Please remember that one wild shot can influence many subsequent shots, and the end result can be really disappointing. You may need to have a deep breath, inhale really deeply and hold breath for a moment and exhale very slowly to maintain focus throughout the plays for almost 5 hours in the course. Please do this every now and then, especially when playing the back nine!! My best wishes to your game this summer and enjoy your game more with better score! 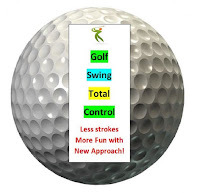 I want to let you all know of new eBook in Kindle, Golf Swing Total Control. The book will give fairly simple but profound messages. I hope you can check it and enjoy it!